Three Classic Simple Machines in One Kit. 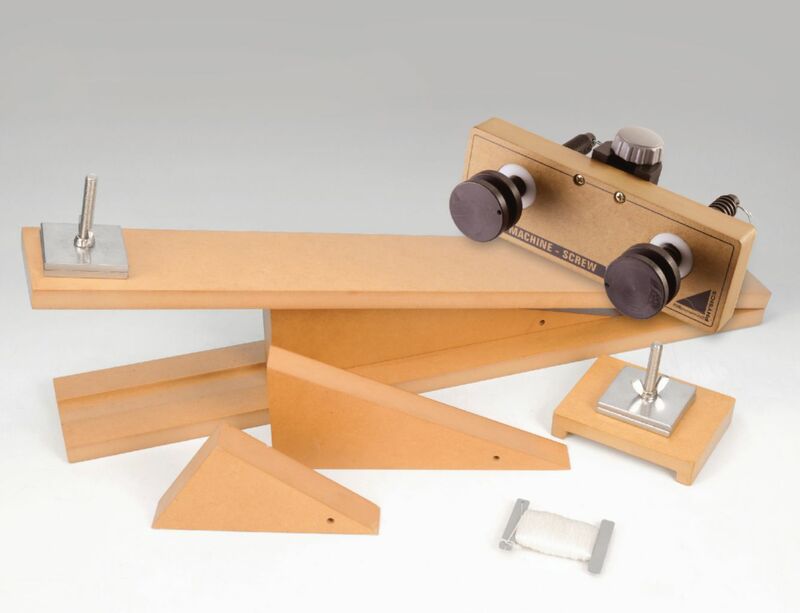 A unique hinged board allows students to pull the wedge with a spring scale or force probe, to calculate its mechanical ability to lift, separate, or hold fast. Weight can be removed or added onto a removable bolt on top of the wedge, to vary the conditions of the experiment. Then transform the wedge into an inclined plane, measuring the mechanical advantages at various angles to reduce the amount force needed to move an object while increasing distance traveled. Finally, attach the screw to the FUN Stand to determine the amount of force needed to lift a weight with the screw. Includes a hinged board, three wedges, two screws with mounting base, slide cart, and instructions.